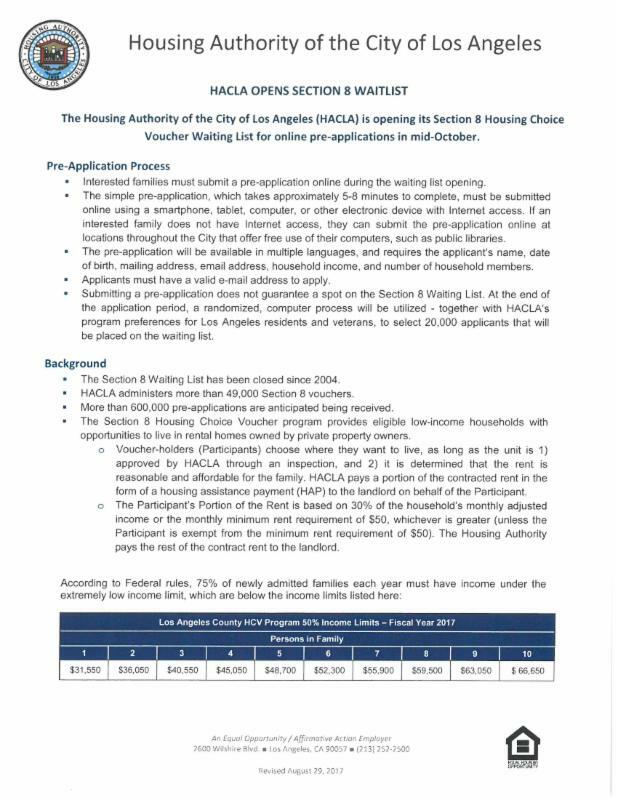 The Section 8 waiting list for housing vouchers has been closed since 2004. 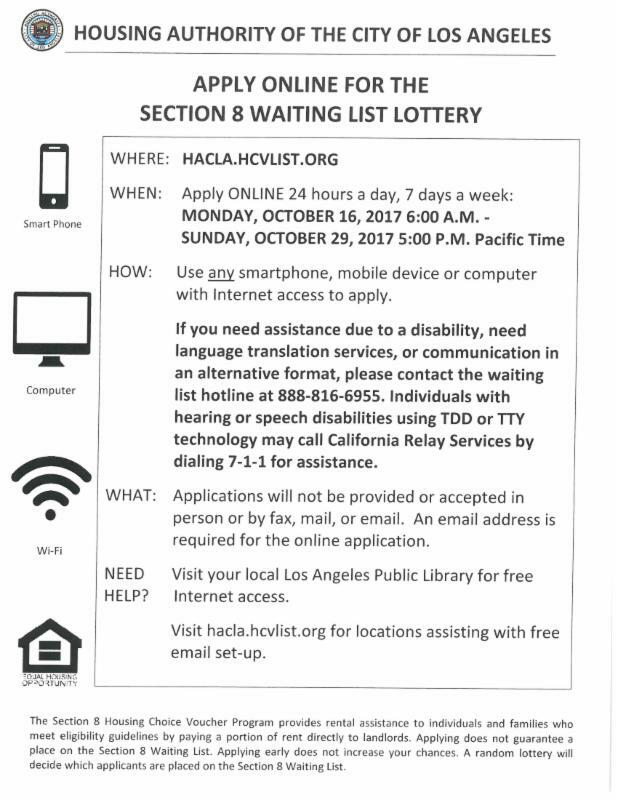 The waiting list application will open on Monday October 16 at 6 a.m. and close on Sun. October 29 at 5 p.m. 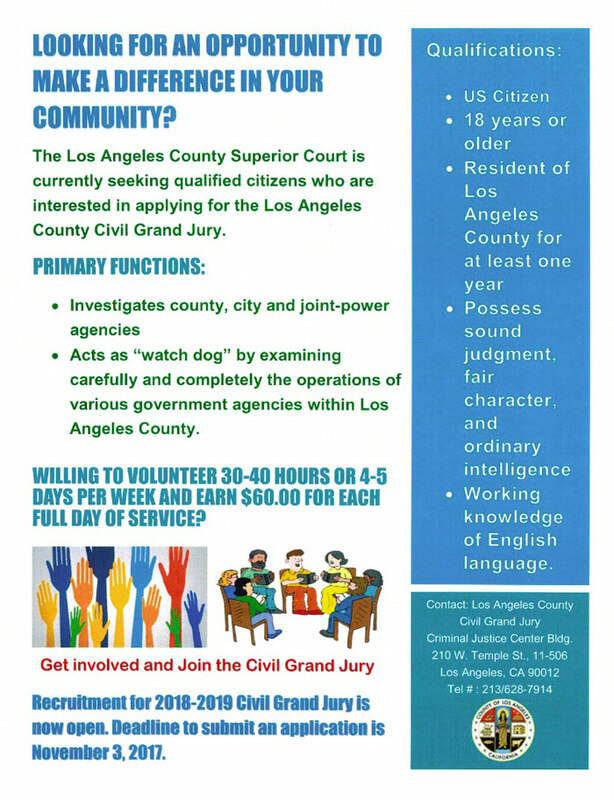 Applications must be received online and applicants must have an email address. Free email sign ups can be done in advance at local public libraries. The name of the head of household, his/her date of birth, current address and mailing, phone number, and social security number or alien registration number, if he/she has one. The name of the spouse/co-head of the household (if applicable), his/her date of birth, current address, phone number, and social security number or alien registration number, if he/she has one. A paper and pen ready to write down the confirmation number of your submitted application for the lottery (you will also receive an email with this information). September is Civic Engagement Month in honor of the work of the Neighborhood Councils and of all the City’s public engagement efforts! 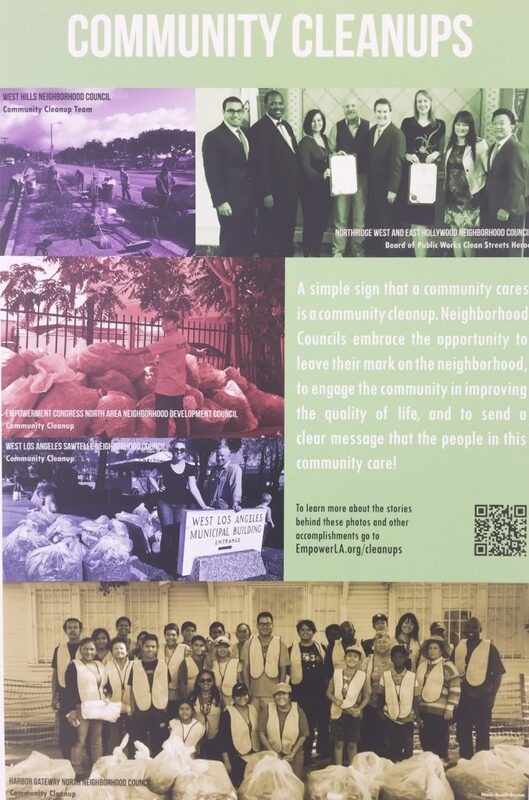 Civic Engagement is about getting involved in your community. You are never too young or too old to get involved. Find out how! The month was kicked off in City Hall on September 1 with a proclamation presented by City Council President Herb Wesson to the Board of Neighborhood Commissioners President Joy Atkinson and Department of Neighborhood Empowerment General Manager Grayce Lui. 2016 EmpowerLA Award winners were honored in City Council Chambers: SORO Neighborhoods Council, Reseda Neighborhood Council, Mid City West Community Council, Central San Pedro Neighborhood Council, Echo Park Neighborhood Council, United Neighborhoods Neighborhood Council and Northridge West Neighborhood Council. For more information on their accomplishments, click here. The big event of Civic Engagement Month is the Congress of Neighborhoods, which was held Saturday, September 9, 2017 at City Hall, with over 1,100 participants including neighborhood council board members and stakeholders. The annual day long event brings attendees together with elected city officials and representatives of city departments for a day of learning and networking. Participants were welcomed in the morning session by Mayor Eric Garcetti, who reminded the crowd how important they are to the City of LA. 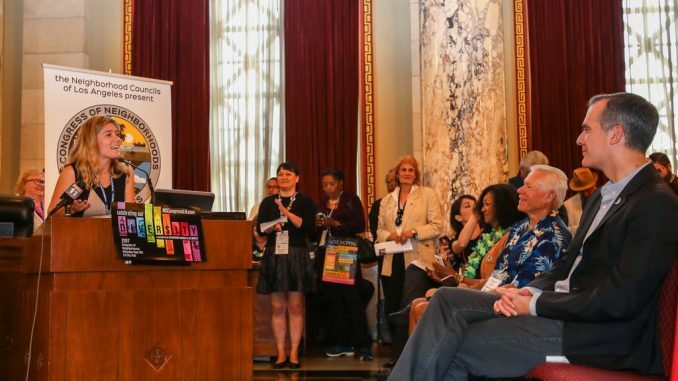 “Congress of Neighborhoods brings together hundreds of leaders from all of L.A.’s Neighborhood Councils — where our residents become active partners in our democracy, help chart a course for our city, and make your voices heard and your values known” said Garcetti. “Neighborhood Council Leaders are Local Stars”. The keynote address was given by LA County Supervisor Mark Ridley-Thomas who began the Empowerment Congress back in 1992 to Educate, Engage, and Empower. He said the need is as strong today to build community together. But it was a 17 year old who stole the show. The Mayor was anxious to hear from Lily Larsen, a member of the Mayor’s Youth Council. She is literally a poster child for civic engagement. She spoke about how her mom took her to the Million Man March when she was five and she has been politically active ever since. She exhorted the crowd, “You are never too young to get involved in your community.” And we presume that you are never too old either! Contact the Board now to share your interest.